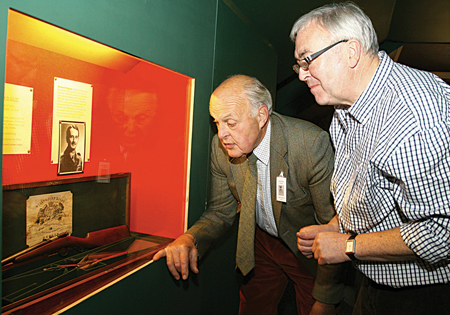 A rifle returns to Coole after eight decades: David Murray Brown (left) talking about Richard Gregory’s boyhood. 22 Winchester rifle, and case, which was stored for safe keeping in the Dublin strongroom of Whitney Moore and Keller, Lady Gregory’s solicitors, in the 1920s for safekeeping. It is now on display at the Visitors’ Centre, Coole. Following the success of the publication Me and Nu - Childhood at Coole published in 1970,* it is sometimes forgotten that Lady Augusta Gregory had three grandchildren, and not two as is often assumed. Written by Lady Gregory’s granddaughter Anne, Me and Nu is a charming account of life at Coole, as the children watched with amusement (and disillusionment at their human foibles ), many of the great figures of the Irish literary movement of the 20th century as they came and went. Lady Gregory’s son Robert married Margaret Parry in 1907. They had three children, Richard, Anne and Catherine. Robert was an accomplished artist who trained at the Slade and in Paris; and for a time worked in the design studio of Jacques Émile Blanche. He exhibited in London, and designed theatre sets for the Abbey. His wife Margaret was also an artist, and they lived for long periods in France. There is evidence to suggest that Robert resented his mother giving so much attention to WB Yeats, who was pampered to the extent that he slept in Robert’s late father’s room at Coole, and on occasions drank the best house wine! Whatever the reason, Margaret and Robert spent their summer holidays, often accompanied by Bohemian artist friends, at the Gregory home ‘Mount Vernon’, New Quay, the Burren. But their children, who adored their grandmother, spent their childhood years at Coole. It is natural in many families for sisters to stick together; and even though Me and Nu is dedicated to Richard, the stories mostly relate to what the sisters saw and did. As the years went by, Richard, through no fault of anyone, appeared to disappear. Yes, there are photographs of him as a small boy pretending to drive George Bernard Shaw’s big car parked outside Coole, and sitting in a wheelbarrow being pushed by Tim Gormley the gardener, and at the seaside with his sisters. Richard died in 1981; and 11 years later, quite unexpectedly, Anne and Catherine drove into the tree-lined avenue at Coole, for the first time since their grandmother died in 1932. Now Anne Gregory de Winton (at the time 81 ), and Catherine Gregory Kennedy (79 ), did blink back tears from time to time as they walked through the estate, and recounted their memories and happy days. They were very complimentary at how well the walks were kept, at how they had no difficulty finding their way around, and they loved the converted stables into the visitors’ centre. They made no comment on the fact that the house was pulled down in the 1940s. They returned each year to the Autumn Gathering (held at the end of September to celebrate the life of their grandmother ), delighting everyone with their stories, and sense of fun. This continued until sadly Catherine passed away; and today, Anne rests in a Devon home in the advanced stages of Alzheimer’s. Their annual visits, which attracted a lot of publicity, inadvertently gave the impression that there were only two grandchildren, and Richard somehow got lost. But last weekend at this year’s Autumn Gathering, David Murray Brown, who is married to Catherine’s daughter Jane, in an interesting lecture, brought Richard back into the picture. Richard Graham Gregory was born at Coole on January 6 1909, and brought into the world by Dr Moran and also Marian Moody, who appears frequently in Me and Nu, and who served the family so loyally for many years afterwards. He was baptised a week later, and among his four godparents were Lady Gregory’s nephew and godson Hugh Lane, and her sister Mrs Arabella Waithman, beside whom she is buried in the New Cemetery, Galway. At 11 years Richard was sent away to boarding school in England , and then following his father’s, and grandfather’s footsteps, to Harrow, where he excelled, winning prizes in science and engineering. He followed his interest in engineering by taking a BA (Eng ) at Cambridge, and having been accepted into the Royal Military Academy, Woolwich, he was commissioned into the Royal Engineers in 1929. When Lady Gregory heard this news, she wrote: ‘Splendid! I am so delighted, it is the only section of the army I should like to see him in, useful responsible work coming that way.’ During World War II he served in India, Iraq, and Persia. He rose to the rank of major. And during all this period, he continued to visit Coole, and last stayed with Lady Gregory in April 1931. He saw his grandmother for the last time in April 1932, one month before she died. He married in 1950 Mary O’Brien Bird, known as ‘ Bobbie’, whom he met the year before in Trieste. Bobby was a senior sister in Queen Alexandra’s Royal Army Nursing Corps. They had no children. But the meeting in Trieste was significant for the family. It was there that Anne’s husband, Brigadier Robin de Winton, was assassinated when, as commander of the British forces, he was reviewing troops on parade and a women stepped out and shot him. After retiring from the army Richard and Bobby moved to Surrey, to be near his mother Margaret ( who after the death of her husband Robert in 1916, married Captain Guy Gough of Lough Cutra, their neighbours at Coole ). After his father’s death Richard was, for a time, the heir to Coole, until it was sold by his mother to the Irish State. When Jane and David visited Richard’s sister Anne some time ago, they asked her if she remembered Richard. Even though Alzheimer’s had already taken its effect, her face brightened: “ Dear Richard. He was the sweetest kindest person you could imagine,” she said. Want to write a Diary? From time to time readers have asked if they could write a diary entry on something that they feel would be of general interest. I am delighted to share the Diary, from time to time, with anyone who has come across something they feel we all should know more about. A King of the Jungle foiled by the King of the Jungle! Sligo must be punished, but how?